The developer tray of photographer Emmet Gowin. It’s difficult to believe that there are, this very moment, an emerging entire generation of photographers that will never have used a manual camera. They will have no concept of a favorite ﬁlm or one suited to a particular purpose, will have never had to wrestle with a roll of ﬁlm that won’t load onto the camera sprockets correctly, or suffer the indignity of doing the same in the dark with a developing reel (stainless steel or plastic?). Take this metaphor into the darkroom, the very guts of Photography 101, and there’s a whole other list of things that any “traditionally” trained photographer’s eyes might be bulging out at the thought of omitting from an education. Take, for example, the mixing of developer chemicals, the washing (and re-washing) of ﬁber-based prints, the highs and hazards of dealing with dangerous raw chemistry that, handled correctly, can yield spectacular results: gold chloride, sodium hydroxide, sulfuric acid. These are the same stuffs that gave us eye-popping contact-sized prints for the nearly two centuries, as well as the stuff that used to blow up attic darkrooms by turn-of-the-century practitioners who didn’t know their chemical properties well enough. A master printer, John E. Cyr knows and understands this historical connection to the analog and the wet darkroom, and what he’s given us to consider here is a kind photographer’s photographer project (and a collection so wonderful and specific I wish I’d thought of it myself). Imagine someone collecting all of the typewriters or writing desks of their favorite authors, or the paintbrush jars of a catalog of famous painters, or the keyboards of people who built ubiquitous apps and programs that we use everyday, and you’d be approaching the spirit of Cyr’s work from a multitude of disciplines. The digital advances in photography over the past ten years have been remarkable. 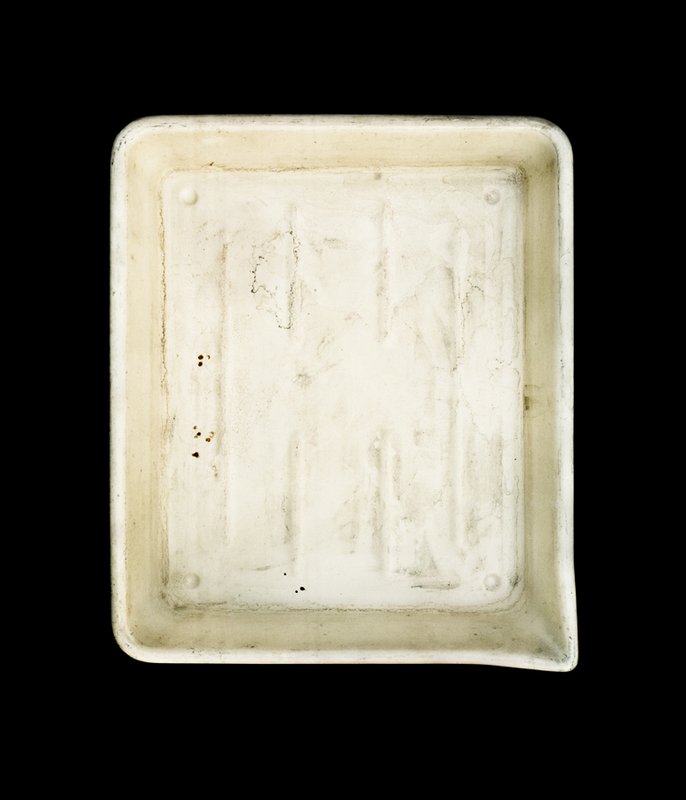 Digital manipulation is found in most contemporary work, even within these developer tray photographs…Many photographers, printmakers, and photographers’ archivists’ have already discarded or thrown out their developer trays because they believed they were no longer significant or useful. I am photographing available developer trays so that the photography community will remember specific, tangible printing tools that have been a seminal part of the photographic experience for the past hundred years. 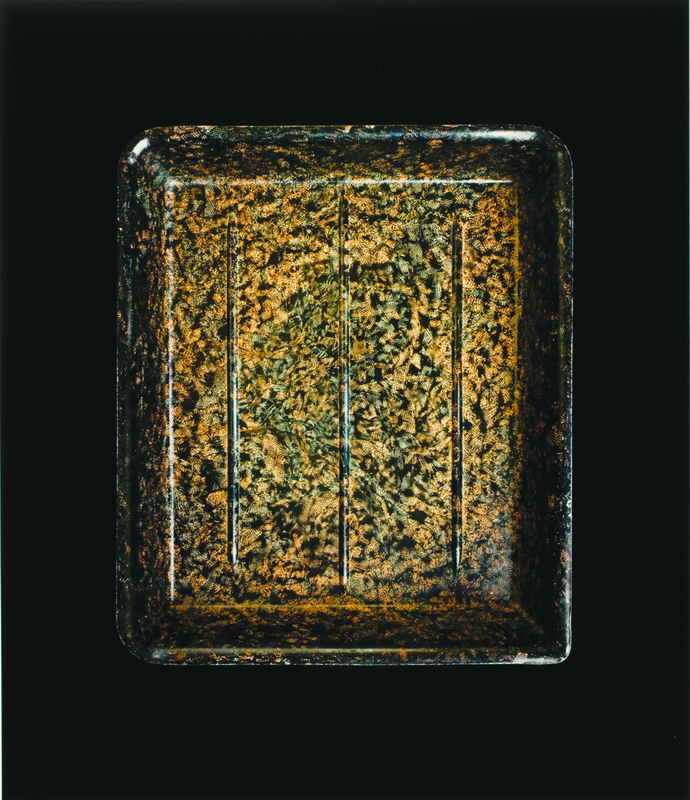 By tilting each tray with its owner’s name and the years in which it was used, I reference the historical significance of these objects in a minimal manner that evokes thought and introspection about what images have passed through each individual tray. The developer tray of photographer Sally Mann. Begun as his M.F.A thesis work at The School for Visual Arts, Cyr began with a short-list of photographers to contact, which after each visit, photographic documentation of developer trays, and a friendly sit-down chat, begat more photography contacts which begat more contacts. In an interview with CDS, Cyr explained, “The deeper I got into this project, the more photographers agreed to be part of it. Once I had a respectable list of well-known photographers who had allowed me to photograph their trays, I think that the photographers I was contacting realized the vast extent of the archive that I was creating and were generally enthusiastic about being part of it.” The on-going list of photographers whose developer trays that Cyr has managed to contact and photograph is an eye-popping who’s who list of both canonically historic and contemporary luminaries in the field: Ansel Adams, Emmet Gowin, Sally Field, Minor White, Aaron Siskind, just to name a few. The administrative and bureaucratic process itself by which Cyr has had to navigate to realize this project could be seen as its own work of art in and of itself. 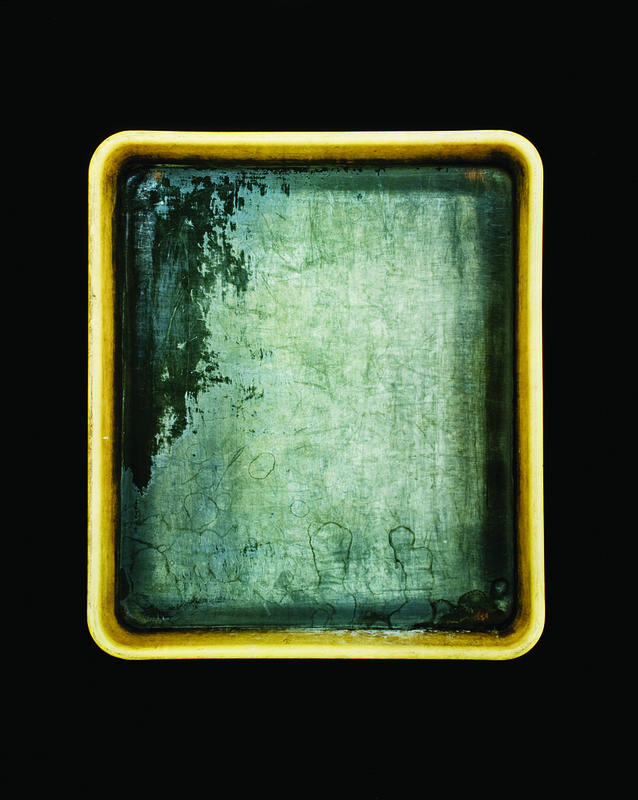 Sometimes the tray of an influential photographer could not be located, Cyr has explained, because upon the passing of that photographer no one in the estate considered a developer tray to be a thing of value, or understood or cared how integral to the process of making amazing images it was. For a photographer, a developer tray is a necessary tool. For anyone else, it’s just a dirty piece of plastic. The developer tray of photographer Aaron Siskind. Developer trays are the first place one places the paper after the image has been exposed on it under an enlarger. Both film and developing paper have a certain amount of silver in them, and the chemicals in the developer tray detect that silver and turns those that have been struck by light into metallic silver. The residue that you see in the images is that left by oxidized silver that remains in the tray from repeated use (and maybe not being totally rinsed clean and thoroughly dried each time). 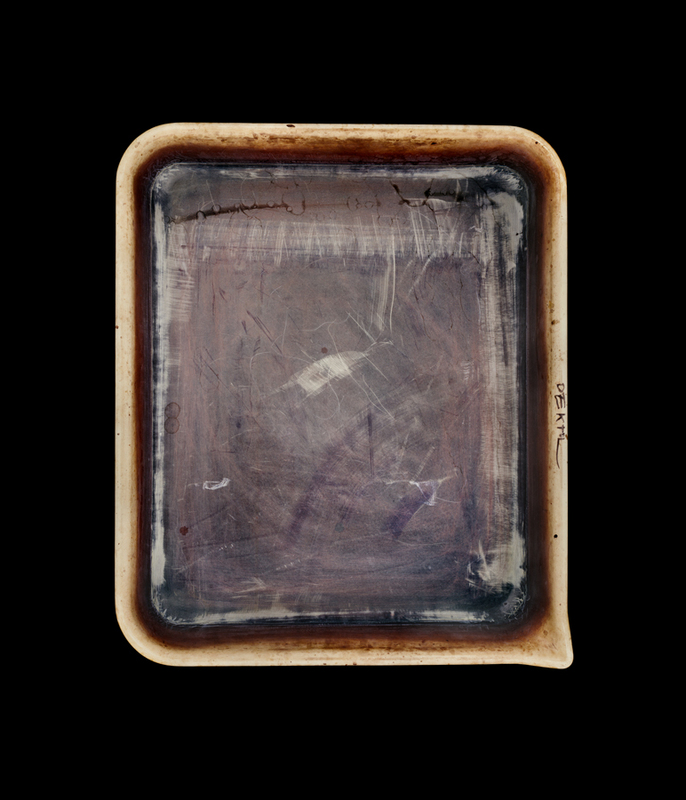 The trays in Cyr’s series themselves vary in scope of perceived use and abuse, in darkness of stains or apparent absence of them, or reveal that a photographer used an alchemy of additives to their developer brew, such as toner, or potassium ferrocyanide, or something else, all to achieve a specific end look to their images. Sometimes the marks left in the tray just indicate that the photographer would absently push the developer tongs over and over the tray or paper in the course of working. There is certainly something of the artist’s aura in this project, a fetishization of object-ness in a field that has become increasingly about objectless-ness by dint of its materials and output having become largely digital and virtual. The developer tray from the darkroom of the George Eastman House. When considering these images, I can’t help but be struck at how alien, foreign and anachronistic—primitive, even—these tools must seem to the emerging population of photographers that have no concept of—or use for—an old, expensive, unhealthy way of doing things. Even as I write this, I ﬁnd I am still incredibly attached to and nostalgic for my memories of, and thoughts of a possible future in, the safety-light red glow of a darkroom, a place where hours passed with a liberating dissociation from time and space, where music was played loud, and where one wrestled with one’s sense of perfection and craft in an endless loop. It feels sobering and dated that I still own t-shirts that are hopelessly and forever stained with ﬁxitive, that a barn attic in upstate New York held my sturdy workhorse 3-barrel enlarger for five years (and now a garage in Colorado does the same), and that an avalanche of bankruptcies have befallen an industry whose dwindling market share cannot sustain itself despite a devoted, fanatical following of artist practitioners that buy dwindling stock by the refrigerator full, and have spent years perfecting their own recipe of film + developer + paper, only to see part or all of that equation continually shifting or becoming entirely extinct. What is photography 101 if not a study of light-and-dark, apertures, f-stops, and the 3-tray process of develop, stop and fix? Still, even if kids today don’t have any affection for these artifacts (and just how and why is Aaron Siskind’s tray so very clean?! ), I like that Cyr calls our attention to our artistic past by invoking these tools as a kind of reliquary. Where indeed can we move towards, if we do not understand first where (and from whom) we have come from? This body of work has been showcased in the NYT’s Lens blog, Slate, Wired and numerous other places. The entire body of work can be seen at the project page on his website. A book of the entire project is also available by Powerhouse books. He is represented by the Catherine Edelman Gallery in Chicago. Once upon a time, I was a contract writer, pitching stories and writing about contemporary photography for 20×200 (and its then other associated brands). The archives disappeared when the company re-structured and re-launched, and some of the people and projects I wrote about then I believe deserve a longer virtual life. Each Thursday for the near forseeable future I will resurrect one such piece, update/embellish it and publish it here. All of these #tbt posts originated on the now defunct Hey, Hot Shot! blog.